Perth Audiovisual has joined with Corporate Theatre Productions. 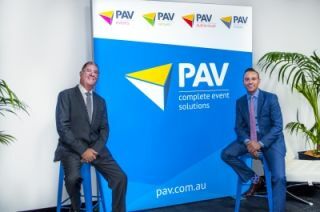 With renovations to their Australian headquarters almost complete, general manager Lee Williams said it was time to unveil the company’s new branding, PAV – Complete Event Solutions. “The same faces are there behind the scenes, behind the controls and on the other end of the phone, but there are some new faces and new equipment as well,” he said. Under the united brand, PAV has reinforced its services in four areas – events, audiovisual, venues, and installations. “Our in-house team includes audiovisual operators, installation crew, retail sales experts, multimedia producers and dedicated set designers and builders,” Mr. Williams said.